OK, remind me who it is out there who got the photo of the squirrel dangling from the feeder! That's all I could think of as this little acrobat did his best number for "my" (human tripod) picture today! Today was the first time they did this for us, and I was ecstatic! Actually (and we laughed and laughed! ), the first to try this, fell out of the tree on this same spot! Unharmed, he only suffered a bruised ego. We got a half dozen wonderful pictures today as they lined up to take peanuts from us. Thank you so much for being so gracious in your comments and for enjoying with me, the mornings with the squirrels. For the rest of this numbers project, I actually have some ideas for other subject matter, hopefully "out of the box", and most likely, out of the park! ha ha! would have loved to see the first attempt! Look at that, so awesome! Great capture I have one similar of a squirrel reaching for a peanut but he was on the ground. Hi Louise, I forgot to mention in my photo caption yesterday that we were very nearly late for school - and hence for the music recital - because I was so busy looking at everyone's photos - I'd started to have a "quick look" around 8 am and suddenly it was 8.35 and I was still in my pjs! - Will and I had to pedal furiously to school on our bikes ( highly unstable with a saxophone in my bike basket) and rush in at the last minute. Oops! I might have to ban myself from logging in on school mornings!! He's hangin' from his toes in this one!!!! :) Great photo. Wonderful, Louise! They'll be following you home soon! Nice picture. You are very creative! LOVE this...can just picture him tumbling out...my cat does that on the bed sometimes when I am playing with him...and oh, boy, Helen has a point about logging in to check these photos before going to work...here I sit when I need to finish getting ready for work as today I have to be there 45 min early!!!!! to pick up my boss to go hear an author speak...OK...I'd better stop for now! I'd love to have seen the one falling out of the tree! Pleased he was just surprised. It certainly is addictive this site, I'm going to see if I can find a chocolate fish this afternoon! Thanks for the comment on the binocular pic, must try some more. What a great collaboration--you, the human tripod and Nutsy. LOL look at him stretching for all he's worth :) Great shot. This is hysterical! Great shot. Those squirrels are going to be inconsolable when you leave for Nova Scotia! Wow! This is fantastic, Louise. I see squirrels dangling from my bird feeders all the time. 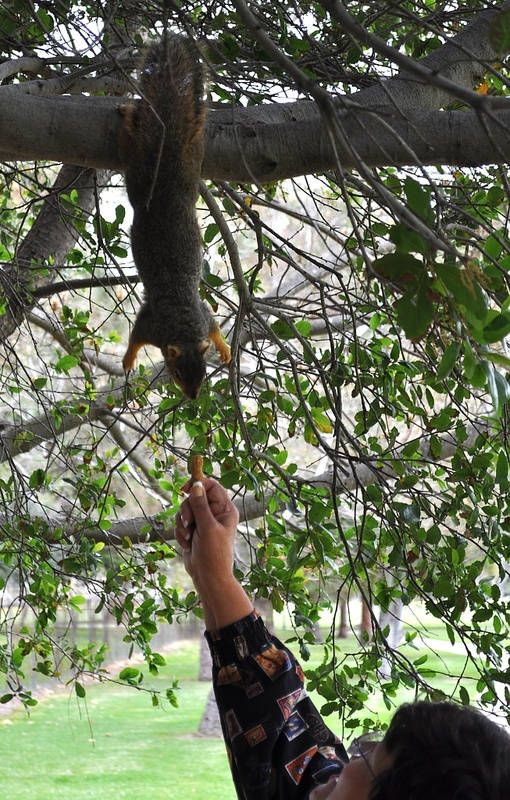 But I've never seen one dangling from a tree branch in order to get peanuts from a human hand. Amazing! And oh-so-interesting! Love it to pieces! Oh, boy, more squirrel shots! This one is hard to beat :o0, can you believe how they can hang on like that! I love it, keep them coming! Do you think that we will need to begin a chapter of AA called 365A. I can see it now, were all sitting in a room together and sometimes stands up and says " Hi, I'm _________ and I am a 365 addict" Ha Ha Ha! OMG! This one is off the charts! You've got them trained so well. If they're doing this for peanuts...just imagine what they might do for money...lol. Hey Louise...I got that Big Peep from the Giant grocery store. I wasn't sure if you were really looking for one or not...LOL I'm sure Lego would like to get rid of his! Louise, you truly are "The Squirrel Whisperer." Great shot! I say, "variations on a theme", and I like it. oh this is great! I have tons of squirrels in my neighborhood, but none like this! Great shot! This is an amazing shot Louise!! loved it!! you are still the cutest ever! bird food. you also asked who had the hanging one from the feeder i believe it was mine unless someone else has a picture like it and called it acrobats. I will never get tired of them. Ahhh, that is so cool! He definitely has an amazing grip. I love feeding squirrels. Awesome capture! Thank you all so much for sharing in the fun! A couple of you had already gotten your squirrel antics on film before I did & I have to share... Bruni took this one, http://365project.org/bruni/365/2010-01-09 and this is from Shutterlove http://365project.org/shutterlove/365/2010-03-23 . Both have some additional VERY adorable pictures of squirrels and chipmunks! I wanted to give them their "Thumbs Up" for blazing the trail! you look like you're havinng a ball! love this pic! yay for Southern Cali, that is where I am too!!! awww, a squirrel! gorgeous :) in reply to your comment, wolf the sticky beak rabbit does live in australia! i didn't realise no one else said that before! How did you manage to get just ONE? Sorry for the cliche, but..."Geez Louise!" This is a phenomenal image! What an acrobat! Great photo! That is hilarious!! They can be quite funny...what a great catch! I love your enthusiasm! This picture is great! Thanks for telling me about the popular page...I clicked on shuffle about 50 times and never saw it once! I really do wonder how we "make it" there??? Amazing!! Such a great capture! My little girl loved it too! I'm totally laughing now because Adeline just said to me, "Mommy, I think she just did that in Photoshop!" =) I think she watches mommy editing too much! LOL! lol.. out of the park! Can't wait to see what you come up with! Oh wow I love this, I love how he's just hanging in mid-air. How cute! brings good memories. I remember feeding a lot of squirrels as a kid...that is a fun picture. I should try again feeding them... we certainly have plenty in our backyard. haha you are so cute louise! i love this. i could honestly look at 365 pictures of you with the squirrels and be entertained. i'm glad the squirrel that fell wasn't hurt, that must have been pretty funny. yesterday i was at a garden center and they had some baby goats and one of them got up on a tree stump and was laying back when he tumbled and did a little flip... totally harmless but cute and hilarious. i always love your photos and your words, i feel like i have a friend down the street! how did you get so many shot of squirrels!? i'm amazed! Peanuts... They sell out easily! How do you get these great shots? My rabbit does lots of fun stuff - like he eats treats from my mouth, but I still can't manage to get a photo of it. Look at him hang by his toes! Oh, Louise, what a lovely photo! I love how you interact with the animals. They seem to be so friendly!